Lifecore R100 Rowing Machine by Lifecore Fitness - Worth the money? Lifecore R100 Rowing Machine – Worth the money? Lifecore R100 designed and developed by Lifecore Fitness is a serious machine for the serious rower. It’s been designed to challenge even the best brands out there, such as the Concept 2. First of all, even though it’s one of the most expensive machines available the moment, you do get value for money. You’ll know this the moment you sit on it. It feels solid, thanks to the aluminum frame and solid steel support. In fact, manufacturers say that it can handle loads as heavy as 600 lbs. That’s a lot, but if you do happen to be a giant, then I guess it’s a no-brainer! Joking aside, there is no doubt that the machine is well built, but there are a still a couple of design issues I didn’t like. The footrests are in a slightly awkward position and no matter what you do, it seems impossible to get completely comfortable. The outward angle forces your legs out making you catch your elbows on your knees on the recovery. However, they are big enough to accommodate my size fourteen trainers, which is not the case with many machines I tested. The speed at which you row, no matter how hard you pull, always seems to be slower than on the Concept2. This is a bit of a subjective opinion, but I have been rowing for many years and have a good feel for where I’m at in a training session. This is only really an issue if you are training to compete and need to compare times with other rowers. If this is the case then you should really be thinking about the C2 as this is the machine on which all the competitions take place. The computer also does not react quickly when you make a change of pace and you often have to wait several strokes before it registers on the display. The resistance comes from a mixture of air dampening and magnetism. This has the advantage of reducing the noise and giving you the ability to control the resistance from the computer. I don’t really see the point in having the air resistance as it is sure possible to vary the resistance to simulate the rowing action on water by just using the electro-magnets. Doing this would certainly reduce the noise levels. Having said that, the machine is not loud and is considerably quieter that the Concept2 – but not as quiet as the water rower, which also uses a strap rather than a chain. Like the Velocity CHR-2001, the magnetic resistance does not simulate the feeling of being on the water well. The monitor is quite fancy coming with a color LCD screen. You can adjust the resistance with the computer and it comes with a number of preset programs and the ability to race against a pace boat. 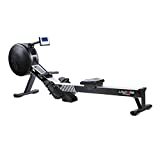 The rower comes with a heart rate monitor and chest strap and one cool feature is heart rate program, which adjusts the resistance according to your pulse. The only drawback with this is that it tends to lose the signal at the end of the pull – I’m 6’4” so if you’re shorter it may not be an issue. Having said that, I prefer to use my Suunto Spartan for HR monitoring as I can then add the results to their software to track my training. Seat – big and comfortable. Has a smooth glide on the aluminium rail. Range of Resistance – Sixteen setting on the computer. Programs – Whole bunch to choose from including adjusting to your heart rate and “white-water” mode, which continually varies the resistance – good for a n interval training type workout. Ergonomics – Good for big and tall people. Footstraps have a funny position – I could never get fully comfortable. The handle is angled in a slight V shape making it nice to hold, but it is somewhat too thin for my big hands. Monitor – Large, in color and easy to read. There is no way to adjust the resistance without the monitor, so if you have no power or it breaks, you’re scuppered! Storage – It comes with a quick release framelock mechanism for quick fold and storage. It also has built-in wheels at the front and rear so you can roll rower into position. Belt Drive – Instead of a chain, theLifecore R100 rower comes with a strap making it quieter than those with a chain. Warranty – Warranty covers free 1 year labor period for home repair. Rowing speeds shown on the monitor are slower than those for the same effort on the Concept2. It also reacts slowly to a change of pace showing. At the end of the day, this is one of the better rowing machines on the market. If Lifecore were to drop the price a couple of hundred dollars, I would say that it was very good value for money. If I were to have to choose between the Concept2, the Waterrower and theLifecore R100, I would pick the Concept2 every time. It’s the little niggles that got me, like the footstrap position and the inadequacies of the computer.